there once was a time when the early versions of Ace of Spades didn't have autoclimb, the feature that automatically and quickly walks you over single-height blocks. back then, Ace of Spades was a slower paced game, and tunnels had a significant impact on gameplay. that was the style of AoS i initially discovered and quickly fell in love with. of course, AoS is still fun with autoclimb - in a different way - because that subtle change greatly affected its gameplay. Y'all probably remember me, but in-case you don't - began playing AoS @ v0.22 and played it for many years, involved in various parts of the community. Been away for quite some time and I'd still call myself somewhat aloof from BnS, but I have been busy! I help run a Rocket League community, who have begun having several weekly streams. 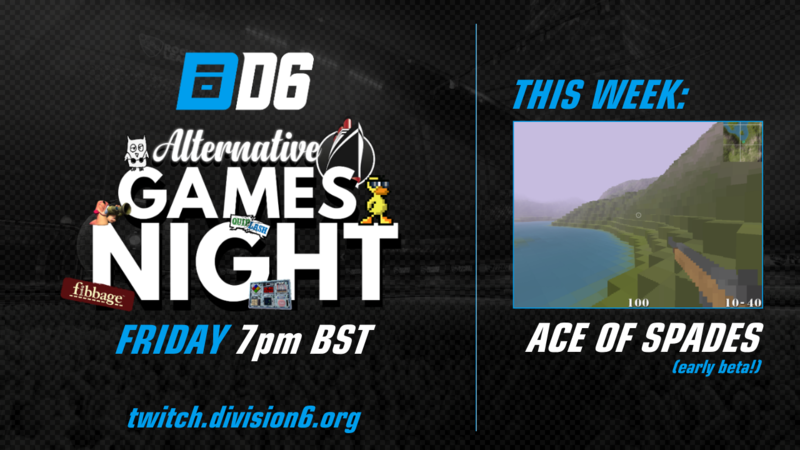 We're called Division6, and every Friday we host an Alternative Games Night (AGN) @ 7pm BST. Last week I convinced 10 newbies to play Soldat (props to you if you know that game), and this week I am aiming to fill a 32-slot server from one of the earlier AoS versions. Gen map, crazy sensitivity, no auto-climb, just the pure gold fun that was the early days. I'm hoping to attract a crowd and get a full server so we can properly get a taste of that feeling, so please tell your old buddies to come back along for a nostalgic wonderland. The client download will be linked to at the very beginning of the Stream, will have an easy 1-click joinable batch file, and the game shall be streamed by me on the D6 twitch channel (http://twitch.division6.org) for a number of hours hopefully (the server will be kept up for the night regardless). Hope to see you all there, and if you have any questions, shoot! EDIT: Here's the download link in advance for all those curious! It's a modded 0.52, with autoclimb taken out, frame rate cap upped to 60 FPS, and master server link removed. Could always use the voice channel on the BnS discord? As an update, all details remaining the same however I will be arranging a second server to be on standby given the interest this is generating. D6 also hasn't played this game before so I may try and split out newer guys/non-tryhards into the secondary server - will see how many viewers show up on the twitch and decide then and there. Also, I'm in the process of making a wee intro video that explains the controls, the game mode etc so it'll be super friendly to any newbie that comes along. Damn, I won't be able to make it. Have fun everyone who will be able to make it! I will be watching videos after lol.